The Internet is built on encryption. Your privacy and security depend on encryption. Your purchases on Amazon. Your 401k and bank transactions. Your credit card purchases. The notion that Apple can break encryption so that the FBI can get data off a single iPhone is simply not true. It's like saying you can stir hardened concrete by using a longer stick. It's not going to work. What's more, the FBI is using an old 18th century legal framework called the "All Writs Act" that has been used before by the government to force private citizens or companies to help execute a search warrant. However, this case is attempting to stretch the interpretation of that law to include something which Apple does not have. And they are trying to force the company to undermine it's own product. The government is attempting to force Apple to spend time and money to create a modified operating system with security features that are removed, taking away our First Amendment right to freedom of speech. The law itself is only two sentences in length. "The Supreme Court and all courts established by Act of Congress may issue all writs necessary or appropriate in aid of their respective jurisdictions and agreeable to the usages and principles of law." Apple is fighting the legal precedent that would be set by this case because of the implications. If the FBI wins, everybody loses. Other US agencies (CIA, NSA etc.) will secretly demand the same access. Foreign governments would make the same requests to Apple/Google etc. to fight their legal battles. The "backdoor" software would become ubiquitous. Crime and fraud would become much more prevalent. In fact, Apple and Google would have to undo the security enhancements that they've incorporated in recent years. Authoritarian regimes around the world are salivating at the prospect of the FBI winning this order. 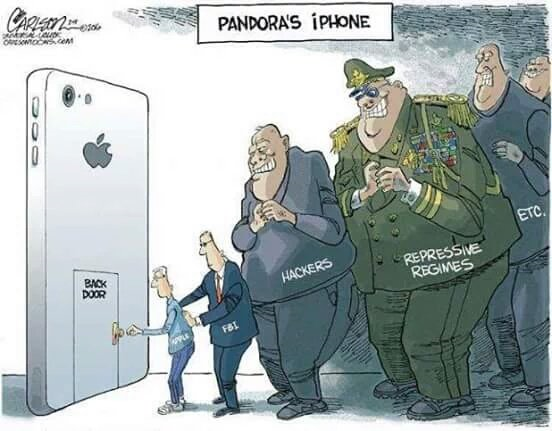 If Apple creates the master key that the FBI has demanded that they created, governments around the world are going to be demanding the same access. We as individuals need to stand up for security and our Constitutional rights, not cower to the fear-mongering and emotional theater. https://drownattack.com affects many large websites.